clip-on eyelets/fixing clips /tarp clips for securing all types of textiles, fabrics, substrates, polythene, tarps and other sheet products. non hemmed fabric, i.e. as tarp clips, banner eyelets, backdrop grommets etc. Holdon® clip-on eyelets offer users a simple, fast and effective means of creating fixing points without the need for tools or special skills. 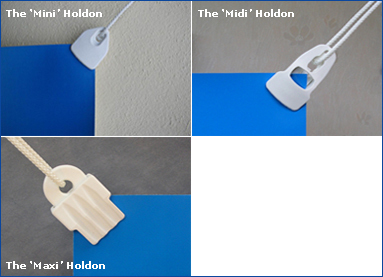 Holdon® is based on the unbeatable 'wedge' principle, hence 'the heavier the load the greater the grip'. Holdon® offers users a realistic alternative to the traditional eyelet / grommet with the advantage of being reusable and in most cases, with much better performance. and Maxi. Coming soon to Galaxy Outdoor Campers. Above: The Holdon in Action.